The centre keeps putting in costly ads providing its success reports on ‘Bharat Nirman’ including that of rural electrification. When I visited Pipra last March, I noticed a board declaring Pipra already covered in Rajiv Gandhi Rural electrification scheme. In eight days that I was there, perhaps Pipra would have received electricity barely for few minutes. Alok had spent on wiring and fixtures in thousands to give me surprise and comfort. But how could Alok get electricity through it? Why should not the centre take responsibility of providing the electricity to the thousands of villages that it claims to have connected? It’s surprising even the power plants located in the state can’t feed the state’s grid beyond its quota. Further, centre hesitates or cancels allocation of coal block for new power plant in the state. Centre’s apathy to Bihar is crossing the tolerance limit. The Centre’s mandate prohibiting production of ethanol directly from sugarcane killed the investment in the sugar industry in Bihar that can improve the economy of the state through cogeneration. Even the chief minister of the state can’t decide the location of a central university neither can he seek upgrade Patna University as one. Centre will not cover all districts of Bihar under the Sakshar Bharat Yojana, a literacy mission aimed for all backward regions in the country. Is it the way a centre deals with a state just because the ruling party doesn’t exist in Bihar for all practical purposes? Can it do the same with any of the Southern states, such as Tamil Nadu? How long Nitish Kumar can go on begging? I put an entry in Face book asking Biharis to organize a candle light protest against the centre’s step motherly behavior in every city and towns of the country. A similar tough stand can be planned against the big industrial houses that show apathy to the state for no reasons by boycotting their products. Bihar government on its own cleared private investments to the tune of Rs 1.5 lakh crore in the power sector. But it hardly means much. It’s also trying its best to complete the modernization and expansion work of the older power plants such as Barauni and Nabinagar. Land acquisition is also a major problem which has held up the private sector power plants. Can Bihar set an example to be the first to find an amicable and innovative enough solution to the land acquisition problem that other state may emulate? Now Good news for Bihar: Adani Power Ltd has agreed to set up 1,320 (610×2) MW thermal power plants and the centre has agreed to give coal linkages too. State electricity Board is ready to buy power. Eight power companies have evinced interest. Let us see how fast it happens. There are means to ease the power problem. And Bihar must go for it whole hog. Gyanesh Pandey has already shown the alternative way for providing cheap and clean electricity generated from waste rice husk for the 380 villages in North Bihar. Why can’t Bihar government assist and encourage the technology to reach every village that produces sufficient husks or alternatives? Interestingly, Bihar annually produces 50 lakh metric tonnes of rice. One can easily calculate the output of husk. I know each of the villages in rice rich Rohtas can have a husk power generation centre. The integration of a briquetting unit for the farm waste can improve its storage and use for longer time. 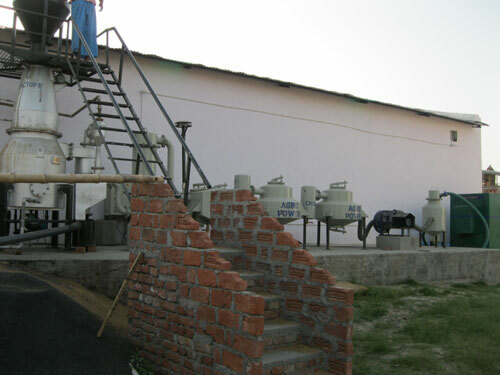 In my own village, I found a rice mill powered by a diesel engine using the gas from rice husk. Bihar can also use the business model and technology developed by another IIT Kharagpur alumnus, S Venkatesam for rural electrification. His Energy Plantation Projects India (EPPI) is working with an idea of “energy forest”. I hope Nitish Kumar also encourage the local entrepreneurs for setting up the local plants without waiting for big power plants to come up.